Lovely spacious and luxurious 3 room apartment in the nice Blijdorp. The house is provided with all comfort and is directly available. Recently, the entire apartment has been thoroughly renovated and is provided with beautiful wooden floors, built-in spots and new kitchen and sanitary facilities. Living in Blijdorp means living in a nice and quiet neighborhood, but with all the amenities within reach. This way you can get your daily groceries at the cozy neighborhood shops in Blijdorp or in the shopping center at Stadhoudersplein. You can also dine out at the nearby restaurants, such as Angeo Betti, Tines or La Pizza. You can also relax in the immediate vicinity. Thus, the popular Vroesenpark is within walking distance. Here you can relax in the sun, BBQ and have a drink or snack at the Vroesen Pavilion. The accessibility is excellent, for whatever type of transport you choose. You walk to the city in a quarter of a minute, with the bike you have been in 5 minutes. Preferably by public transport? The metro stop Blijdorp (Line E - Randstadrail The Hague - Slinge- Central Station), the stops for bus lines 44 and 33 (to Rotterdam Airport) and tramline 25 (including Rotterdam Central) are also within walking distance. Entrance with a staircase to the 1st floor which gives access to the hallway. The hall gives access to a seperate toilet in addition to access to all rooms. The house has a spacious and bright living room with luxurious open kitchen which includes various appliances such as dishwasher, combi oven, fridge freezer combination and 6-burner gas stove. The living room has sliding doors to the balcony on the sunny back to the south. The apartment has two spacious bedrooms and a luxurious bathroom with walk in shower, double sink with luxury mixer cranes and a chrome towel radiator. Both bedrooms have nice spacious fitted wardrobes, and as the living room as well wooden floors and built-in spots. The house also has a separate storage with connections for washer and dryer. 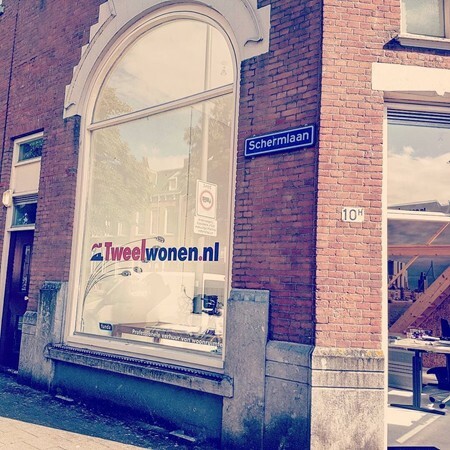 Please contact Tweelwonen Rotterdam for more information or to schedule a visit.